Starch & Sweeteners - Hydro-Thermal Corp.
Starch is a diverse industry that encompasses multiple products including sweeteners, paper products, foods such as soups, mayonnaise, and beverages. Each of these producers have their own unique concerns. 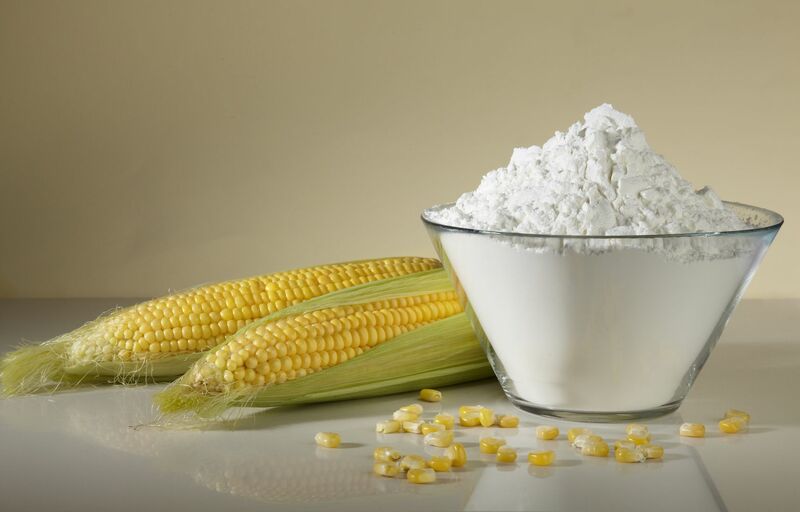 Achieving the maximum conversion of starch to sugars is the key goal in both the ethanol and sweetener industries. Once the sugars are created, the goals in these industries change but the process in both to create those sugars is very similar. The need to be able to produce and maintain a very accurate uniform temperature in the mash flow and being able to create an adjustable shear are the two key features provided by the Hydroheater/Jetcooker. Being able to adjust the ΔP is achieved by Hydro-Thermal’s adjustable combing tube. This feature provides the ability to create the optimal amount of shear to optimize yield, produce a very high level of product quality in the case of sweetener plants, reduce enzyme use, and reduce overall energy use. Hydro-Thermal’s patented heating solution addresses these issues and comes with a team of experts ready to help you achieve your processing goals. The type of heater you need is dependent on how it will be used. 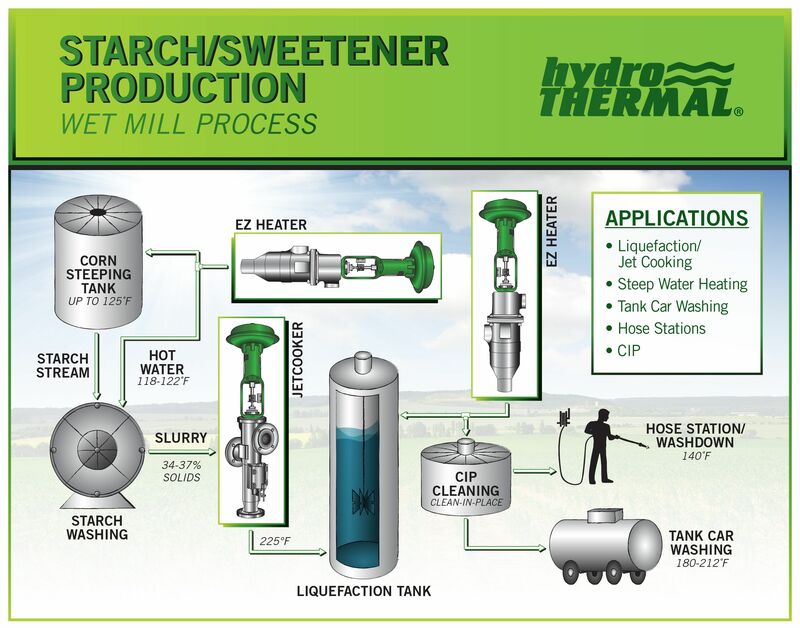 No matter what your application, Hydro-Thermal has the solution for every application involving the starch industry. In the resources section below, there are several jet cooking documents with more information. Each company is unique in their specifications for the fermentation process. Hydro-Thermal has several robust products that give producers the flexibility they desire. Industrial Hydroheaters are versatile and are backed with over 80 years of proven technology. Hydro-Thermal also offers the Sanitary Hydroheater (a 3A solution) which works well for grain mashing in malt/extract syrup/dextrose applications or beverage alcohol applications. Provides accurate high temperatures while using as little steam as possible to hose wash stations. During cleaning and wash down at a facility, it is common to run out of hot water. The spargers or heat exchangers are not flexible enough to account for the varying conditions of wash down versus normal production. Hydro-Thermal’s solution is flexible enough to provide hot water instantaneously at your desired temperature even during plant wash down. Precise temperature control combined with adjustable shear, allows for the ability to optimally produce emulsions for starch-based sauces. Achieve ideal temperature and reduce infection by recovering the dirty stream and putting it back into the process. One benefit of this application is ensuring that the ideal temperature is going into the tanks. In addition, it reduces contamination/infection risks that could negatively impact production and yield. Click here for a brewery CIP case study. 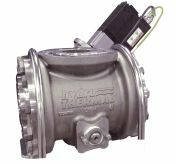 Header supplies hot water to applications off a single recirculated line. Replace multiple stations and mixing T’s with just one central EZ Hose Station system. The EZ Heater’s self-cleaning design eliminates scaling or fouling due to hard water. The EZ Hose Station also eliminates the need for steam piping to each individual hose drop while providing accurate and safe temperature control from a single location with steam-safety features integrated directly into the system. Whether it’s one or multiple stations, the EZ Heater hose station system will meet your needs in a safe, effective way. Proper cleaning and sanitation is an important concern for you and your customers. Hydro-Thermal’s solution allows you to clean equipment at the optimal temperature in one pass. If caustic or aseptic solutions are being heated, then the Hydroheater can be manufactured using 316L material components. Whether you need to heat a tank or heat on the discharge to the exact temperature, the Hydroheater can meet your needs.